Planning a large party? Ask us about our 28” party pie! 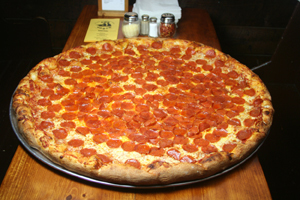 Each pizza is equal to four large pizzas and can be sliced into 32 squares or 16 VERY large triangles. Toppings can be different for each ¼ of the pizza. A maximum of four toppings is available (or else it gets too heavy). Ask about our seasonal soup and beer specials!